But, wow, the weather really changed since the last week. And it is so noticeable in the hurry-up fashion of people right now—as if they are trying to race the weather to wherever it is they’re going. All wrapped up in their almost-winter coats and tugging on their collars. I almost expect them to start blowing on their hands for warmth. Though I have to admit: my dual layer of tee and flannel shirt had me huddling myself for some warmth as the sun went down. It’s easy to see why Thomson Reuters should be leading with the iPad prize—and not a trip to the South Pole at this stage (though the street team in Moscow may be a little, “Meh…”, about it all). 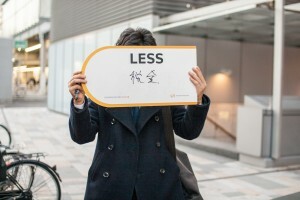 One thing that strikes me about this campaign is the fact that out of all of the various markets it’s being conducted in– London, Moscow, New York, Paris, Toronto, Hong Kong, Singapore and others—the visuals of Japanese kanji against the simple English white board asking stating “More” and “Less” are quite striking. Even if you can’t understand them. The Thomson Reuters Eikon campaign only has the plain Jane English ones online, though. Too bad. I like the natural high key nature of the shot taken in the afternoon on a dark day. High key photos always convey a mood of optimism and happiness (which is why they are used so much in toothpaste ads and home deco marketing). Lots of exposure, very little contrast, and the grin on his face are all you really need (if I were a Photoshopist, I suppose I might take out the black bike wheel, but I kid of like it). The security guards in the background just give it a little something extra. To set up high key photos usually requires a lot of lighting equipment and reflectors and the skill not to overdo it. It’s good to get a shot like this every once and a while with no setup involved. Uplifting. A high hey on a low key day. 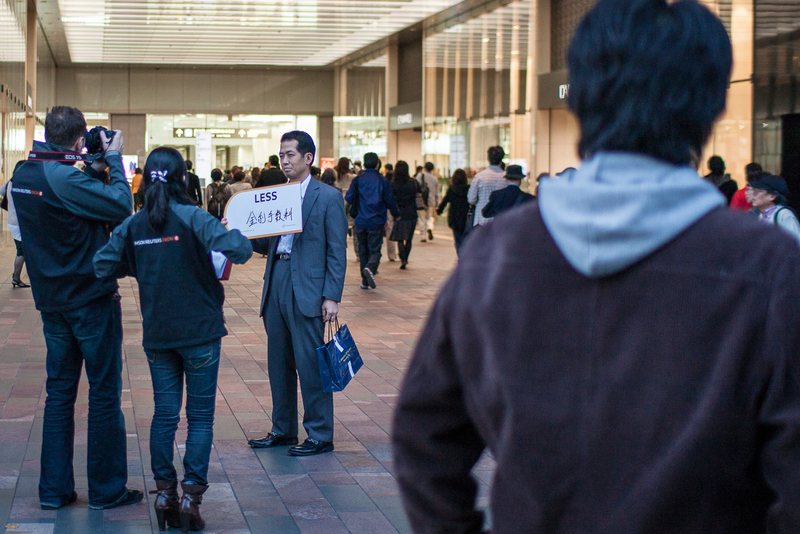 At this point, I wanted to get some video to post with my iPhone 4, but he finished up and took off in a dead sprint through the crowd and across the street to the big Mizuho bank and I wondered if I had not only scared him from really expressing himself about “the future of finance” (as much as one can…) and showing his face, but also from sticking around. Guess I’ll never know.